On Thursday, The Root staff writer Michael Harriot and I argued as to whether the agreement reached between NFL owners to donate some $90 million to various social justice causes as an answer to players’ protests was good business or just hush money to silence a movement. I posited that protest had sprouted a monetary achievement and an opportunity for an underserved community to benefit from the attention the protest garnered. 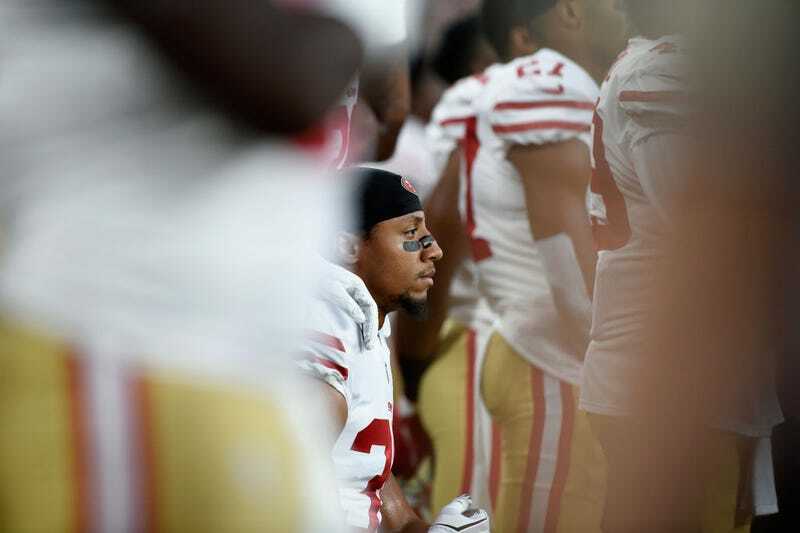 I should’ve known that if San Francisco 49ers safety Eric Reid (who’s been boots on the ground with Colin Kaepernick since the beginning) and Harriot (a writer whose work I respect) weren’t behind the payout, then I should have had pause. Although both Harriot and I were conflicted about the news of the donation, I took the side that argued how the money could be put to good use. Turns out I was on the wrong side of history, and the NFL is exactly who we all believed it to be. The money provided for the donation is going to be siphoned from the NFL’s funds for breast-cancer awareness and military-service initiatives, so it won’t cost the NFL a dime, according to Slate. That’s pretty low, even for a group of old white billionaires. “We didn’t agree with that, because we weren’t trying to cut other worthy programs,” Reid told Slate on Thursday, adding that he and several other players decided to leave the Players Coalition, headed by the Philadelphia Eagles’ Malcolm Jenkins and former wide receiver Anquan Boldin. This is a payoff at the highest level, and although the agreement wasn’t explicitly stated as quid pro quo, Jenkins has already noted that he won’t be protesting now that an agreement has been reached, according to ESPN. He said that he’s going to stop his protest, which he’s been carrying out by raising his fist since week 2 of the NFL season, as a show of good faith toward the NFL’s commitment to helping the inner city. Slate notes that the Salute to Service program supports military personnel and raises “awareness for the sacrifices they make on our behalf.” Which means that the NFL owners, who have largely opposed the protests during the national anthem, even going so far as to label them un-American, would be taking money from a military program to shift money to social justice reforms. Which all seems a bit disingenuous. According to ESPN, Goodell was “furious” to learn that the players had not agreed to stop their protest after the proposed deal had been reached, even though there had been no agreed-upon deal that players would no longer protest if money was donated to social justice causes. Reid told Slate that he believes the expectation was that a generous donation would stop their protest. Another issue that Reid had with the deal is that he doesn’t even believe the money was going to go to deserving causes. “It’s a charade,” Reid told Slate. “It’s basically going to be an NFL Cares,” he said, referring to a league public service announcement campaign that was rolled out whenever the NFL has a bad public image—e.g., domestic violence, CTE (chronic traumatic encephalopathy). Reid added that the stipulations on the money also included the NFL having a say over how the money was allocated, meaning that if Reid and his NFL brethren believed that the money should be spent teaching an underserved community their rights when dealing with police, the NFL could decide that said money would be better spent making commercials showing that the NFL cares about social justice. So Reid wanted no part of what has been a sham at best. Read more at Slate and ESPN.